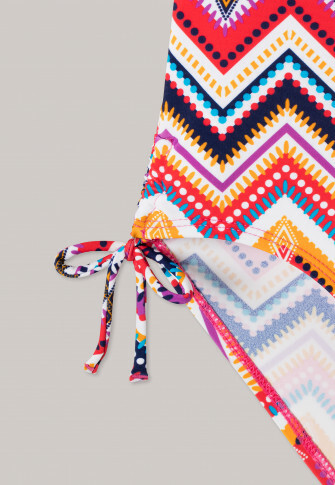 This pretty girl swimsuit shines with the sun around the competition! 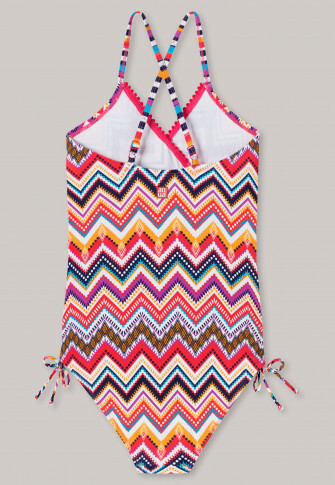 The colourful pattern mix of stripes and zigzag of the one-piece spreads a real summer mood and gets further playful highlights with the cool wrap look on the chest and pompoms on the neckline. With the crossed straps and practical drawstring at the hip, the perfect fit is guaranteed and nothing stands in the way of a relaxing day on the beach. A summery play of colours in best SCHIESSER quality! from the SCHIESSER swimwear collection Aqua "Ethnicoast"